It's been three weeks since the "airport moment" we'd been dreaming about for nearly 3 years. Only it wasn't a dreamy airport moment. There's a reason you didn't see a video of the moment we got Clementine at the airport in Ohio. It wasn't pretty, and neither were the moments that followed in the week after she came home. We waited at the airport for the family who escorted Clementine home to bring her off the plane. With phones ready and eyes teary, we watched her sleep as the man carried her through the doors. I tried to gently pull her into my arms. I had waited for this moment of holding her so long, and I had wanted it to go well so badly. And, well, it went badly. But it's always nice to have a reminder that it's not about me. 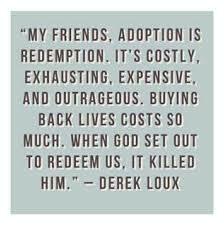 This adoption has never been about me, except maybe to show me where God is working and for Him to allow me to see it. I will never forget the deep hurt I heard in her cry when she was placed in my arms. Utter sadness and loss coming straight from her soul, that's what I heard. I understood, yet I could never understand the sort of loss, hurt and fear she was feeling. Brad held her and calmed her while I continued to hurt for her without the ability to help. After celebrating the homecoming of our friends who had escorted her home with their daughter, we took a shuttle to our hotel while she continued to be confused and hopelessly sad. Brad may have been vaguely familiar to her because of his visit last summer, but nothing else about this experience was. It was cold, she had just completed over 30 hours of traveling with a family she didn't know, she missed and longed to protect the relationship she had with her "mamas" who had loved her and cared for her in DRC, and she didn't know what was coming next. Her sadness and fear were palpable as we laid down in the hotel. She fell asleep on Brad as I went out for diapers, and I was only able to be near her as she slept without knowing I was near her. She awoke at 5 am the next morning. Without a word she quickly hopped out of bed and stood, staring in bewilderment at Brad and me. She looked back and forth between us as we struggled for words and actions that could comfort her. We offered snacks, play jewelry, a baby doll, a blanket, a movie. She stood, staring at us with fear in her eyes and strength in her demeanor. Then she cried. Again, she wouldn't let me near her. Brad comforted her and she watched a movie with him while moving away from me and keeping a suspicious eye on us both. She acknowledged me at breakfast, after I brought her food, but still I couldn't touch her as she clung to Brad. At the airport, she played peek-a-boo with me while clinging to Brad. She cried when he went out of sight around corners. At home for the next week, she needed to be held by Brad constantly. The need was constant, and she wanted him to be standing, preferably moving, the whole time. She cried that deep, mournful cry often. Our other kids hurt and mourned the time they had with us before. Their hurts were clear. The boys missed wrestling with Daddy. Oaklee was fine but needed to be held more often at night. I continued to be sick for the third week in a row. (I went to the doctor twice...unheard of for me, but my wise mom made me, and she was right to do so!) I missed "normal" (as normal as you can have with three kids 4-and-under) conversations. Brad needed to get back to work, for purposes of sanity of productivity. I know many people wanted some pretty pictures in that first week. They wanted proof that Clementine was happy to be home with her forever family. I wish I could say she was, that she totally understood what happened and that she was meshing into our family with ease. I wish I could say she had an inkling of an understanding that we wanted the very best for her, that we wanted the very best for her future and we wanted her to know the love of a forever family. But she didn't, and it showed. I didn't want to paint a pretty picture that didn't exist. I wouldn't have felt right about posting pictures of her smiling that would have given a false sense of perfection and well-being in our home. She simply couldn't understand it all, and no one in our family handled it exceptionally well. Pretty pictures existed in small doses, but a pretty home life did not. Pretty pictures did not tell the whole story. Cognitively, we knew that the first weeks after her homecoming would be hard. However, after a 2.5-year wait to bring her home we thought we had experienced enough hard moments to make this sort of hard easier. The truth is, adoption is hard on all levels. The wait was extremely painful and difficult (DRC waiting parents...you are still experiencing the hard wait, and we continue to pray and fight for your families to be united). However, the week after she came home was even more difficult than we imagined. This is often the case, as we heard from several adoptive parents who experienced similar hardships after bringing their children home. Honestly, we thought we had ruined our family. That sounds extreme, even as I type it (but it is also a normal reaction, from what others have told us). I assure you, it was an extreme week. We thought we had ruined our other three kids, and I secretly wondered if she would have been better off continuing to live where she was comfortable in her foster home in DRC. Only, I knew we were wrong in thinking that way. She needed a family. WE are her family, and we had to fight to find the truth of that and the truth that God is capable of redeeming the hurt and the time. I can't help but think back to this quote that filled my spirit in the beginning of this process and continues to fill us up as everything else is emptied out. Never has the quote above been more true or more fitting. Never have we been this thankful for what God has done to adopt us into His family or the road we have traveled to adopt Clementine into ours.